So say a large and growing group of consumers. There are multiple ways consumers are expressing this, from actively using ad blockers, to moving beyond “freemium” sites and content to those offering an ad-free experience with a paid subscription, or simply reducing their media consumption. Ad blockers are being used by a substantial share of online adults in the US. Based on our 2017 wave of Technology User Profile throughout the US, 40% of Connected Adults are actively using an Ad Blocking app on at least one of their connected devices. Ad blockers are being used across a range of user’s connected devices. The highest rate of ad blocking is on PCs, followed by Smartphones, and then Tablets. The Ad Blocking rate is even higher among the most-active news readers. This rejection doesn’t bode well for ad-supported business models, such as that of many media outlets. Digital consumers continue to value an ad-free experience, whether for news, music, or video content. Consumers enjoy convenience and continue to respond to offers marketed as free. Although these hopes and preferences may persist, what matters more than wishes are what consumers do. Action matters more than opinion, just as behavior carries more weight than intention or preference. Seeing that so many consumers, especially such highly-engaged ones, continue to take the extra step to actively block ads continues to send the messages to advertisers as well as news outlets. Meanwhile, many media outlets have gotten the message and moved their ad-free experiences behind paywalls. Others encourage freemium customers to at least whitelist their publications. To the extent consumers lower their defenses, this may reduce the value consumers place on being ad-free. In turn, this may encourage more consumers to return to being active readers. This post includes a complimentary brief summary of recent MetaFacts TUP (Technology User Profile) research results. These results are based on results of the MetaFacts Technology User Profile survey, from TUP 2017, its 35th consecutive wave, as well as previous waves. Comparable results are available through TUP fielded in Europe and Asia. For more information about MetaFacts and subscribing to TUP, please contact MetaFacts. Are Smartphones really for fun, not communicating? 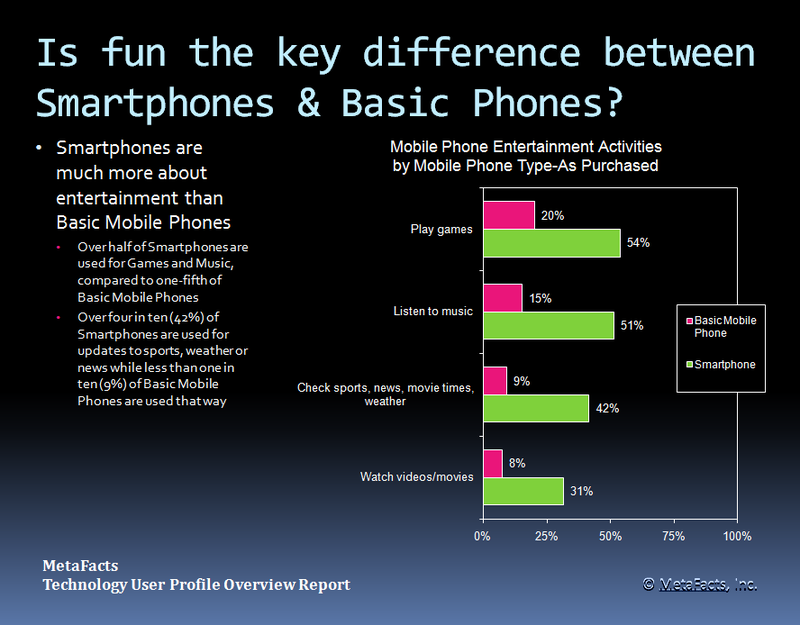 Are Smartphone subscribers more about fun than communication? Is entertainment that much stronger for Smartphone subscribers than for users of Basic Mobile Phones? Is the lack of a boss key because mobile phone users feel freer to have fun with their handsets than their PCs? For Smartphone users, it’s not only playing games like Angry Birds that is widespread. Activities such as listening to music, watching movies, and checking sports and weather also are prevalent. These fun activities are much more popular on Smartphones than on Basic Mobile Phones. For most key entertainment activities, more than three times the rate of Smartphone users find ways to play than the percentage of Basic Mobile Phone users. Playing Games and Listening to Music are activities for more than half of Smartphone users, and for only one-fifth or less of Basic Mobile Phone users. High-end app developers may be amazed that any Basic Mobile Phone users find ways to use their simpler phones to have any fun at all. That might be considered a glass half-full view, with the prospect that someone eager enough to struggle with the limited games and web access on most Basic Mobile Phones may be a great candidate to switch to a smartphone. The half-empty types may see this as a reality that for many consumers, good enough is good enough. They may be satisfied with simple games for casual play, and may be less prone to upgrade their platform. In either case, this highlights that app developers, handset makers and carriers need to look at the demand across multiple platforms so they don’t miss out on market opportunity or dissatisfy important customers. Diving a little deeper into the Technology User Profile survey responses, fun is also age-linked. The game-playing rate among age 18-34 mobile phone users is 42% versus half that (21%) among those aged 35+. Although to a great extent, Smartphones have been more strongly adopted among younger than older adults, taking age into account; Smartphone users are simply more fun-oriented than users of Basic Mobile Phones. Fun isn’t the only driver for Smartphones; communication does rate more highly for Smartphones than for Basic Mobile Phones, with usage broadly spanning phone calls, text messages, voicemail, and email for two-thirds or more of Smartphone users. For Basic Mobile Phone users, only phone calls and text messaging are used by over half of the users. Looking ahead, bandwidth-hogs such as multi-player games and video calls are likely to drive demand for Smartphones as well as underlying wireless networks. However, as carriers seek to optimize their spectrum and profits, data caps or throttled apps may discourage the most active subscribers. Then, these users will either revert to other devices, or app makers and service providers will find ways to further optimize precious bandwidth, likely increasing supply to satisfy the demand driven by so many consumers. The results in this TUPdate are drawn from the MetaFacts Technology User Profile Survey. In our most recent wave of Technology User Profile, we surveyed American adults about their use of mobile phones, technology attitudes, and many other behavioral and socioeconomic factors. Current TUP subscribers can access and drill down more deeply into this phenomenon using TUP Interactive Access or with their datasets. We started this analysis by first looking at the answers from 8,175 U.S. respondents in the Technology User Profile service and then drilled down further into their profiles to get a more complete picture. Contact MetaFacts to access the MetaFacts Technology User Profile Overview Edition report, which covers the broader range of key trends. View findings in 25 pages of executive summary analysis, 200+ pages of charts and graphs, all supported by 95+ pages of detailed tables. The complete, 300+ page report is delivered to you electronically. These editions are for the U.S. based on the 2010 wave of Technology User Profile gathered among a scrupulously selected set of representative respondents, surveyed both online and offline. To see other research coverage of Internet products and activities – from smartphones to feature phones, desktops to notebooks, social networking, demographics, and attitudes – see the many other questions TUP answers on www.technologyuser.com. Tech market research professionals who want a solid resource they can use immediately after industry events such as mergers, or even use prior to anticipated events, can license direct access to TUP. MetaFacts releases ongoing research on the market shifts and profiles for Smartphones, Netbooks, Mobile PCs, Workplace PCs, Home PCs, Web Creators, Broadband, and many other technology industry trends and facts. These TUPdates are short analytical articles in a series of specific topics utilizing the Technology User Profile Annual Edition study, which reveals the changing patterns of technology adoption around the world. Interested technology professionals can sign up at http://technologyuser.com/contact/ for complimentary TUPdates – periodic snapshots of technology markets. MetaFacts helps technology marketers find and measure their best and future customers. MetaFacts’ Technology User Profile (TUP) survey is the longest-running, large-scale comprehensive study of its kind, conducted continuously since 1983, the year before Apple released the Apple Macintosh. The detailed results are a primary market sizing and segmentation resource for leading companies providing consumer-oriented technology products and services, such as PCs, printers, software applications, peripherals, consumer electronics, mobile computing, and related services and products. TUP analyzes key trends and the data-rich source can be dived into more deeply for custom analysis. For more information about the syndicated research service, analysis tools, publications and datasets, contact MetaFacts at 1-760-635-4300. Email is the top-ranked activity for newly purchased home PCs as it is for all PC users. 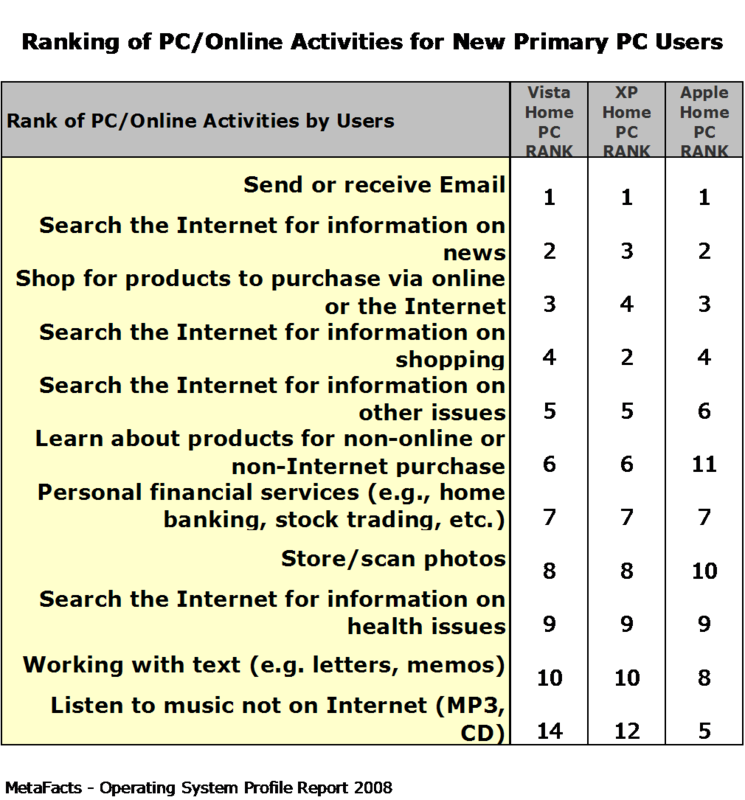 New XP PCs second-ranked activity is searches on shopping where Vista and Apple users search the Internet for information on news. New Apple users’ ranked frequency of listening to music CDs and MP3s at 5 which is even higher than all Apple users at 9. While music moves upward in rank; working with text drops to 8 for new Apple users from 6 for all Apple users; and learning about products for non-online purchases drops to 11 for new Apple users from 7 for all Apple users. MetaFacts releases ongoing research on the market shifts and profiles for Windows Vista, Mobile PCs, Workplace PCs, Home PCs, Broadband, Digital Imaging, and many other technology industry topics. These Profile Reports are in a series on specific topics utilizing the Technology User Profile Annual Edition study, which reveals the changing patterns of technology adoption and use in American households and businesses. Interested technology professionals can sign up at http://technologyuser.com/contact/ for complimentary TUPdates, periodic snapshots of technology markets.